It's January ... although with this weather (ice and snow) you would think it's November or probably December but I suppose ice and snow are more common in the UK at the start of the new year rather than the end of the last year. In my head I feel like it's Spring now - even though the Spring Equinox (or the first day of Spring) isn't until March 20th. As it feels like Spring I felt like doing a clothing/wishlist post for all things 'Spring' which means green (or white) depending on your mood but I chose green as it's a good, lively colour. 1. Hollister Long Sleeve T-Shirt with Sleeve Print in Green - £19.00 - I'm loving long-sleeved t-shirts at the moment as it's still cold and it keeps my arms warm. 2. ASOS T-Shirt With Brush Stroke Print In Relaxed Skater Fit - £12:00 (on sale £7.00) - I love minimal t-shirts and this is just a brush stroke design and nothing else. 3. Minimum T-Shirt With Stripe - £30.00 (on sale £18.00) - If you saw my posts from last year you knew I was loving stripes so I had to sneak one into this post. 4. New Look T-Shirt with Pocket in Aztec Print - £12.99 - I love t-shirts with little pockets and I love them even more when the pattern is different and funky looking. 5. 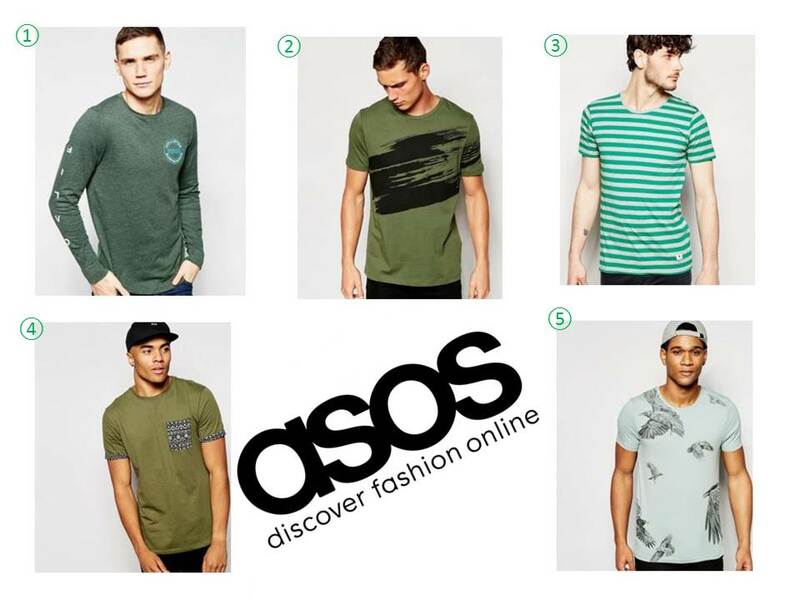 ASOS Muscle T-Shirt with Bird Print In Green - £14.00 - Fade-effect seems to be a thing at the moment - I've bought a couple faded-t-shirts and these birds are slightly faded on the t-shirt which looks great. Do you have any plans for a 'Spring' wardrobe or are you still recovering from Christmas and your bank account can't take another hit? Let me know in the comments below.